Welcome to the worm buffet. The mere thought of slimy worms makes us queasy, but to the adorable little guy in Early Bird, they're dinner. 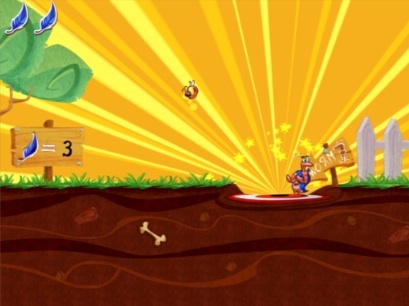 Booyah's enjoyable iPhone and iPad title has but one goal: get the bird to the bulls-eye, whereupon which he (or she) feasts upon a wriggly worm and you advance to the next stage, earning big points along the way. Getting there, however, takes some skill. To set the bird in motion, you swipe in any direction. You can even swipe in mid air for added boost. Thing is, Booyah only gives you a limited number of swipes per level, and you must land on the bulls-eye, even just the outer edges, to succeed. Swipe too much, and the bird misses it completely. The beginning stages take little effort to beat, but later boards definitely test your skills, as you navigate past different objects and through loops Sonic the Hedgehog style to claim your prize. That said, there's a bit of a learning curve in figuring out how far the bird can travel, but you should have a solid grasp of things in a few minutes. Then it's just you and 72 challenging levels spread across three unique worlds; perform well enough, and you'll climb the online leaderboard. On that note, Early Bird is a great addition to the App store. Not only is it addictive, but the game packs a ton of value into a very affordable price ($0.99 on iPhone, $1.99 on iPad). Give it a look. 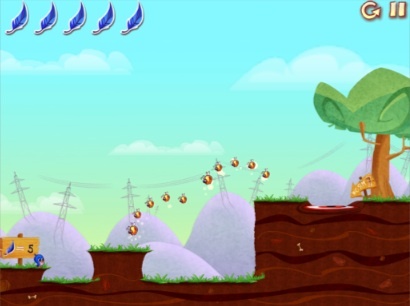 What's Hot: Adorable birdie, 72 levels, Game Center support, cartoon style graphics, fun. What's Not: Not universal, learning curve may frustrate inexperienced players.